The last time Mayo were pitted against Kildare in a championship game the Newbridge or Nowhere phenomenon took over the GAA conversation for a week. This time around when the respective counties u20 sides run out to do battle on Croke Park, there is nowhere else either sides supporters would like to see their teams going into action. Sunday's All Ireland u20 final will be Kildare's eighth championship game this year, while it will be Mayo's fourth. The Leinister u20 championship had a round robin series of games where Kildare beat Wicklow and Laois and lost to Meath, but they still managed to make the quarter-final stages of the competition where they dispatched Carlow with ease and did similar to Offaly in the semi-final. In the provincial final - they really laid down a marker seeing off Dublin on a scoreline of 1-15 to 0-10 to take the Leinster crown and if people still weren't sure of their quality - their 1-14 to 1-13 victory over Kerry in the All Ireland semi-final was the real stamp of quality. Davy Burke's side are coming into Sunday's game battle hardened and are a team that know how to run up a score. Over their seven championship games to date they have hit 14-106, an average of 2-16 in each game. Ballyteague's Jimmy Hyland has been ripping it up front front for the Lillywhites hitting 1-8 against Kerry in the semi-final and eight points in their provincial final win over Dublin. Hyland and Brian McLoughlin are a formidable full-forward pairing with Paddy Woodgate who is named as the third man in the front line of attack, playing a more withdrawn link role. 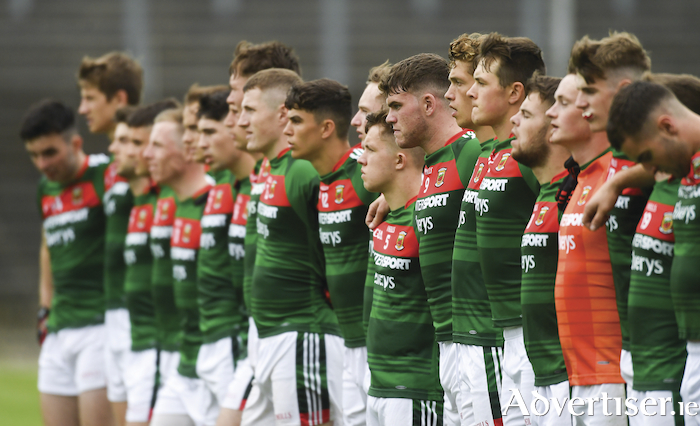 Mayo's full back line of Johnny Maughan, Brian O'Malley and John Cunnane will have to be on top of their game to keep the Kildare trio under wraps in the open expanses of Croke Park. The Mayo half-back line trident of Paul Lambert, Cathal Horan and Oisin McLaughlin have not only been a defensive shield for Mike Solan's side all season, but a massive attacking threat with their powerful running from deep a key part of the Mayo game plan. On Sunday they will be looking to push the likes of Darragh Ryan, Tony Archibald and Padraig Nash onto the back foot from the get-go and give Mayo the impetus to get the scoreboard ticking over. The midfield battle will be key come Sunday lunchtime, Jordan Flynn and Evan O'Brien bring a good mix of physicality and box-to-box play that should keep the Kildare duo of Aaron Masterson and David Marnell occupied over the course of the hour - in what should be very intriguing face off in the middle third. Mayo's half-forward line of Nathan Moran, Tommy Conroy and Ryan O'Donoghue have been a vital link and scoring threat throughout the championship so far and the Kildare half-back line of Jason Gibbons, Stephen Comerford and Rudhán O'Giolláin will have to be on their toes right from the throw-in if they are going to close down that particular threat. While Mayo have been very impressive in their victories over Leitrim, Roscommon and Derry to date - they will be wary that Kildare come into this one with a lot more championship football under their belts and have bounced back from a defeat to Meath early on to blow through the rest of Leinster with ease and come out on the right end of a serious battle against Kerry in the All Ireland semi-final. In that final four victory they didn't score for the final 13 minutes of normal time or any of the six minutes of injury time that was played and if Mayo can keep Kildare scoreless for any period of that length of time they will be confident of tasting victory in Croke Park. Page generated in 0.0997 seconds.